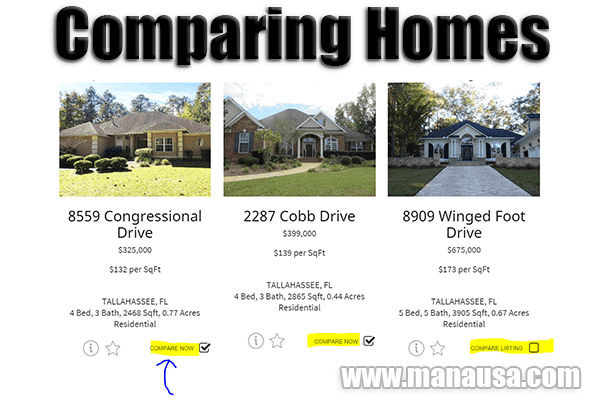 So You Want To Buy A Million Dollar Home In Tallahassee? If you are thinking about buying a million dollar home in Tallahassee, I must warn you that much of the real estate advice you might be reading online is inaccurate (or downright misleading). The market for these homes is not necessarily the same as homes priced at the heart of the market. Before we get into specific advice for homebuyers, let's explore the current inventory of homes for sale in Tallahassee over $1,000,000. As you will see from the list of homes that have sold for more than $1M at the bottom of this article, five were sold in 2016. But when we drill down and only select existing homes (meaning no new construction), we see that only two existing homeowners were able to sell their homes for $1M or more. The graph below shows the number of existing homes that sold for $1M or more each year going back to 1991. We can observe that existing million dollar home sales were nearly non-existent before the housing market boom 15 years ago. They flourished during the expansion phase of our market and have regressed to an average of four homes per year over the past 7 years. With all the data that we track for the Tallahassee real estate market, we are very confident in the advice we provide to people selling a home, buying a home, and for those doing both. We share with them a lot of market information so that they can see the big picture, and we help them determine the best course of action when negotiating during a sale. Nevertheless, there are two key variables that we diligently track that could absolutely blow away our recommendations on million dollar home negotiations, and these variables will have opposite effects. The first variable is more likely (and bad), while the second is less likely (and would have a positive impact on the high end homes market). Would you be surprised to learn that 27% of million dollar home buyers paid cash, meaning 73% borrowed money for the purchase of their homes? This means that luxury homes and estate sales exist in a market that is built upon fragile ground. Currently, mortgage interest rates are less than 50% of their 50 year average (simply put, rates are incredibly low). If you note the explosion of million dollar home sales in the graph above, it corresponds to the time frame that mortgage interest rates were lowered, primarily due to the efforts of the Federal Government trying to save the collapsing housing market. If mortgage interest rates return to normal, I believe we will lose more than half the buyers that are currently able to afford million dollar homes, and thus the existing supply of homes will likely exceed 10 years (six months supply is a healthy balance). So if you own a million dollar home or if you are planning on buying one soon, make sure you discuss mortgage interest rates and their impact on you being able to sell your home. It's happened elsewhere, but we haven't seen any real job growth in Tallahassee. 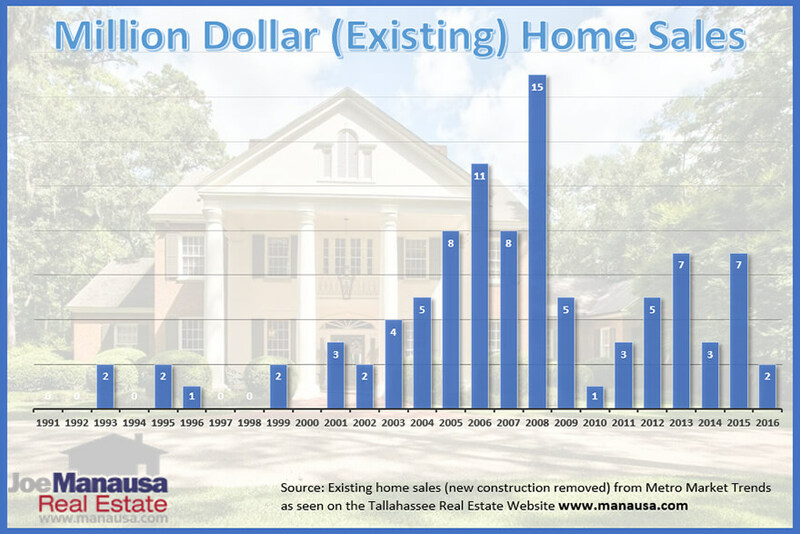 If a major employer would relocate operations to Tallahassee, we would see the demand for million dollar homes move higher. I do not have any faith in our local government's ability to help Tallahassee in this manner, but perhaps positive circumstances beyond their control (like industry growth relating to the Mag Lab) might just yet blossom. I certainly would not make a home buying decision based upon the expectation of more million dollar home buyers moving into the area in the foreseeable future. What Should A Million Dollar Home Buyer In Tallahassee Do Today? The smart advice is to be a diligent shopper. Remember, there are plenty of homes out there and many buyers are making a HUGE mistake ... they are buying new construction. Last year, there were a total of 5 million dollar homes that sold (2 were existing homes, 2 were new, and one was really purchased for the land). Use our side-by-side comparison tool to help make the final selection(s). Unless a particular home really grabs you, this tool will help you find the hidden value among your choices. Remember, even in this crazy market, the amount of money you should offer on a home is not determined by its list price, rather it should be based upon what you think the home is worth (an amount you think the seller could get from another buyer). At the higher price point, there is very likely going to be a discount in your offer. At some price points though, you might offer above list price. It is critical you and your real estate buyer's agent discuss pricing strategy for your offer(s). If you are building or buying a new home, you'll pay a premium that will likely take 10 or more years to recover. The safer bet is to buy an existing home that is fairly new but the seller is motivated to move. It's not likely that you'll have competition when making an offer, so consider making simultaneous offers on multiple homes so that the sellers understand that they stand a great chance to lose you to their competition if they do not act. Make sure you work with a real estate agent who can communicate market conditions to the seller (it is likely they have not received an accurate assessment of the market from their agent). 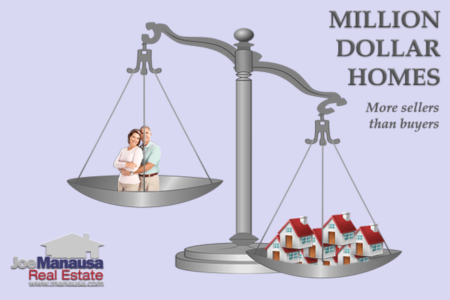 Contrary to the housing market at prices below $400,000 where it is a hot seller's market, the million dollar homes market is incredibly unbalanced in the favor of the buyer. If you choose wisely, you will be buying your million dollar home for a whole lot less than it would cost to replace. Try to ensure your agent approves of the location and the exterior amenities, as those will be critical if you end up having to sell in a difficult market. 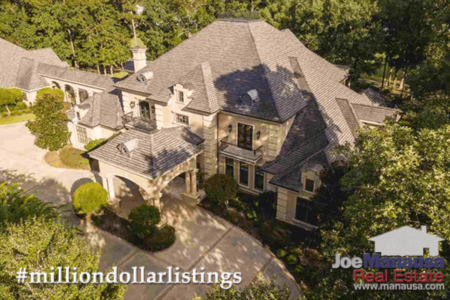 What Should A Million Dollar Home Seller In Tallahassee Do Today? If you own a million dollar home, please read the previous section. It is what informed buyers are going to do. You have a tough decision to make ... stay, or go! Don't be one of those crazy homeowners who have their home on the market for five years, always being prepared for the next looky-loo wanting to come through and see your glorious home. If you are not willing to price your home to be one of the best four deals on the market, why do you think you'll be one of the four sellers who succeed this year? Supply and demand rule every market, and that is very much true in the million dollar homes market in Tallahassee. There is too much supply and we're making more. If you don't have to move right now, take your home off the market and enjoy your million dollar home. You'll help reduce the supply and that will help sustain values for the day when you ultimately do need to move. When that day comes ... don't hire a "yes man" or "yes woman" either. Interview professionals who will tell you what you need to do to sell your home. Make them demonstrate a real knowledge of supply and demand and don't let them "relationship" you to death so that you end up hiring somebody who will fail to sell your home. If you've been on the market for a year ... you need a different real estate company. Move on. Sadly, we see some million dollar listings stagnate for years and years and years. Don't let this be you. The following is a list of all home sales at $1M or higher in Tallahassee since 1991. I hope our report on Million Dollar Homes in Tallahassee has been useful for you. If you plan on buying a home soon and want expert advice for the area and price range for which you are shopping, simply drop me a note and we'll be in touch right away to set a time to meet and discuss your needs.